Preheat oven to 350F. Clean the dirt from the beets. The skin will come off after they’re cooked, so the beets don’t need to be scrubbed. Trim beets at both ends. Place foil on a cookie sheet or pan, then place beets on top of the foil, along with the garlic. Drizzle with olive oil and sprinkle on the rosemary, thyme, whole cloves of garlic, salt and pepper. Make sure that the beets get coated with the oil and spices. Add 1 cup of water to the cooking pan before covering tightly with foil. If you want, you can also cover the pan with parchment and then foil. Roast in oven for 45 minutes, or until beets are tender with a fork. 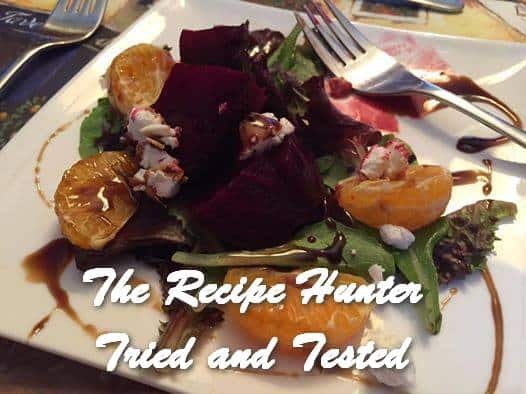 It took much longer than that for my beets to cook – about 1½ hours; maybe my beets were larger. The beets will come out nice and steamy and tender. Slice and add a few tablespoons of goat cheese. I used a balsamic reduction, over salad or just with some good bread. I chose to use some tasty orange sections which turned out to compliment well.